People who like cars like to get their windows tinted. It is a common practice among vehicle owners. However, there are some issues to be concerned with. One of them is “how to get bubbles out of car window tint”. When air is trapped under the window film, it forms a bubble. People get bothered because of these bubbles and sometimes remove the window tint. But there is a simple solution. By following some easy steps, one can easily get rid of these air bubbles. For the best result and reducing the chance of damage, it is necessary to make the adhesive amenable. It is better to work in an environment where the temperature is above mid 70 degrees Fahrenheit. So you better pick a clear sunny day to ensure it. Take your car to a place where the sunlight reaches easily. Keep it there for an hour or two to make the adhesive weak. It will help you to handle the adhesive easily. You can also use a hairdryer enough sunlight is not available. When the window of a car is exposed to enough sunlight, the film is easier to replace without damaging the quality of the adhesive. If you find it still difficult to remove the film, you can use a mist sprayer. It is very helpful. The cool mist will interact with the heat of the sun. This process will make the adhesive on the window very flexible. In this step, you have to use a safety pin to get rid of the air bubbles. Make a very small hole and be careful. Do not tear the car window tinting while making the hole. A gentle poke will do the trick. Sometimes you might find a cluster of air bubbles. You must repeat the poking process for every bubble. The window tint might get dry if it requires too long. In this type of situation just moisten the tint again with the mist again. The air that trapped will escape through the hole eventually. As the holes are very small, they will automatically close during the removal of air pockets. 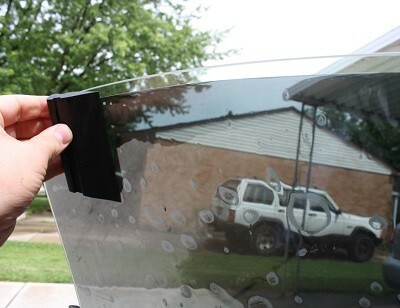 For smoothing the window tint to push out the air, you can use a plastic. Slide the plastic through the window tint. Again, use gentle pressure while sliding. Too much pressure can damage the tint. Remember to moisten the window tint whenever necessary. 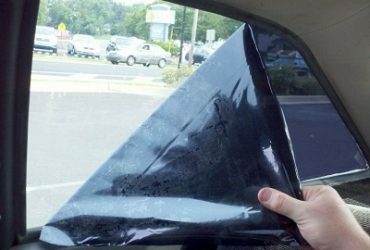 Hopefully, this DIY guide on how to get bubbles out of car window tint has helped you out. 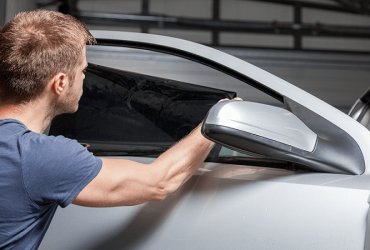 You might also want to check out this DIY guide on how to remove window tint.